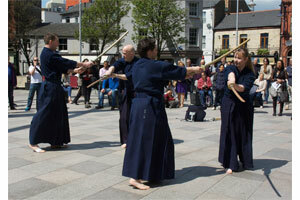 and Exhibits celebrating Japanese Culture & Literature, was held in Cardiff Central Library on Saturday 25th May 2013. 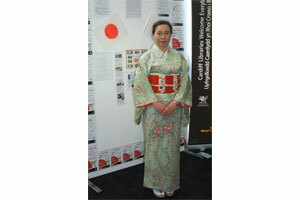 This event was organised in partnership with local Japanese community members, Routes into Languages and the Cardiff based Saturday Japanese School in Wales. 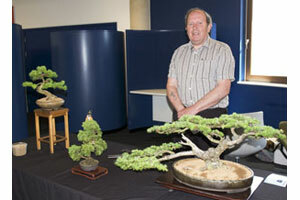 An exhibition of bonsai (miniature trees) was provided by Keith Wilson, the secretary of the Glynderi Bonsai Club. Along with displays of Japanese books and areas for Traditional Children's games, one room in the library was set aside for Origami, Calligraphy and learning to use Chopsticks. 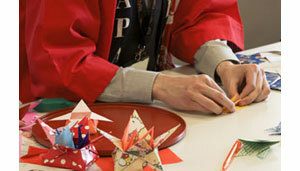 Origami is the Japanese art of paper-folding. 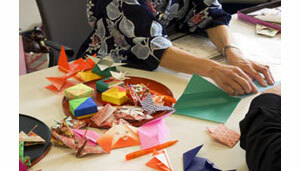 Participants were able to create a number of different paper objects such as cranes and candy boxes. 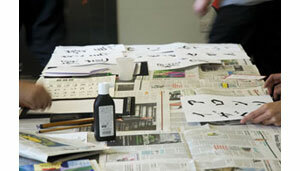 Names and words reproduced in Japanese Calligraphy with brushes and Sumi ink. 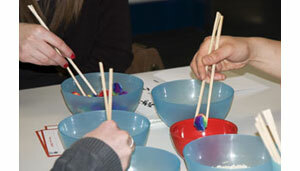 Games played using simple wooden chopsticks. 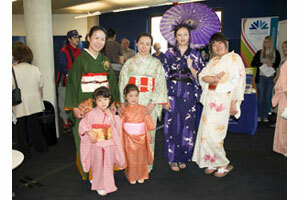 Many of the organisers and participants came dressed in traditional Kimono & Yukata, providing a stunning fashion parade. Another area was set aside for visitors to dress in colourful summer Yukata. Club Taishikan is a workshop organised by the Japanese Embassy's Japan Information and Cultural Centre (JICC), aimed at introducing various aspects of Japan to young people. • Club Taishikan Link. 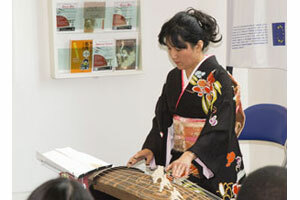 Throughout the day visitors were treated to traditional Japanese music. 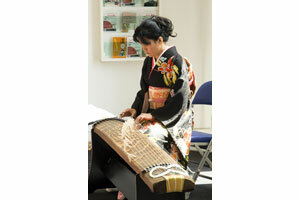 In addition to piano music, there was a beautiful koto recital by professional musician Hiroko Sue. 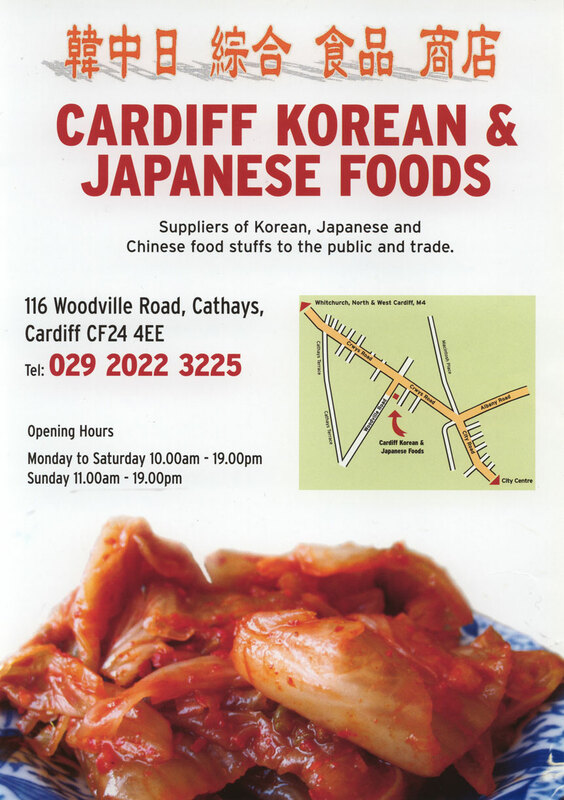 A selection of delicious Japanese and Korean food was on sale, courtesy of Jason Park, owner of the Cardiff Korean & Japanese Food shop in Woodville Road, Cardiff, CF24 4EE. 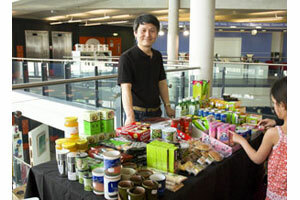 Andrew Yamaguchi attended with a selection of Japanese green tea, and news of his new Japanese restaurant, Mount Fuji, which opens in June 2013 in Cardiff, Saint David's (opposite Pret a Manger). 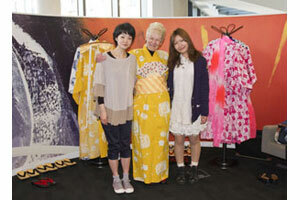 An 'Anime' workshop and exhibition was provided by Graphic Designer Akatsuki. Akatsuki (Asuka Bochenska Tanaka) is the creator of wonderful designs and comic books. Throughout the day, Daniel worked on a painting of Mount Fuji, one of Japan's most iconic landmarks. 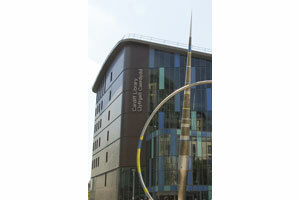 Daniel studied at • Cardiff School of Art & Design, Howard Gardens Campus, Cardiff, CF24 0S. Mitsujiro Nao is not only an accomplished artist, but also the Dōjō Chō of the Renseikan Kendo Club. Impressive demonstrations of Kendo were made both outside and inside the library on the day by some members of the Renseikan Kendo Club based at St. Joseph's R.C. High School in Newport.